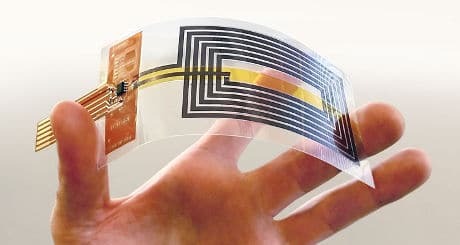 Fully flexible NFC antennas made from graphene could match the performance of conventional metallic antennas, making connected wearable devices cheaper and more energy-efficient, a consortium backed by the European Commission says. Researchers from the Graphene Flagship — one of Europe’s largest research initiatives with a €1bn (US$1.07bn) budget — designed an antenna that could exchange information with NFC devices such as a mobile phone. Graphene is a single layer of carbon atoms arranged in a hexagonal lattice and is about 100 times stronger than the strongest steel, as well as being a very efficient conductor of heat and electricity. The flagship says the “graphene-based NFC antennas are chemically inert, highly resistant to thousands of bending cycles and can be deposited on different standard polymeric substrates or silk tissues”. “A key target for modern technology is to replace metals with lighter, cheaper, less energy-consuming and better recyclable materials. Due to its unique combination of superior properties, graphene can be used to produce fully flexible NFC antennas,” says Vincenzo Palermo from the Graphene Flagship’s Italian partner the Institute of Organic Synthesis and Photoreactivity, which undertook the research. “The possibility to produce fully flexible, graphene-based NFC antennas showcases future applications such as wearable NFC tags interacting with smartphones and other devices.